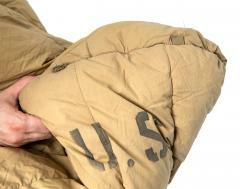 A real deal M-1942 sleeping bag of the US Army, jesus christ what luxury in its time! Contract of 1943, used but in very good shape for its age, could even be used. The mummy bags sure haven't changed much. 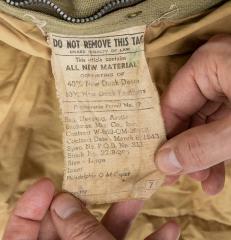 This American bag is the heart of the Mountain troops' sleeping bag system, filled with duck down & feathers (!). Size Large, and fits probably a person up to 185 cm of height. 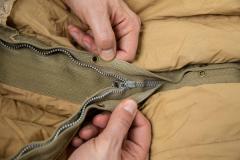 Clearly used with some oxidation in the metal zipper etc., but everything works. 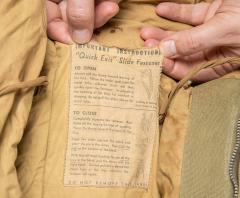 The tie-down straps at the leg ends have been cut off. Of course we can say nothing about any comfort values and such. The filling feels pretty lofty still.